An experiment with leftovers yields a delightful, filling vegetarian meal. An experiment with leftovers yields a delightful, filling vegetarian meal. Reprinted from The SparkPeople Cookbook: Love Your Food, Lose The Weight (c) 2011 by SparkPeople, Inc. Permission granted by Hay House, Inc., New York, NY 10033. Available wherever books are sold. I cooked up a batch of dried beans that I seasoned with onions, garlic, chiles and spices. If you use canned beans, you might need more spices. Serve this with steamed broccoli or wilted spinach and a dollop of light sour cream or plain Greek yogurt. 1. Preheat oven to 350° F. Prepare a 9” x 9” casserole dish with nonstick cooking spray. 2. 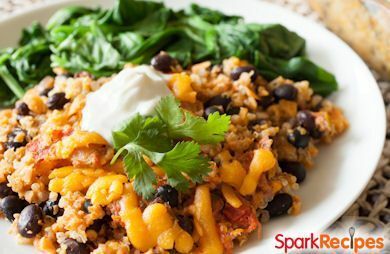 In a large bowl, mix together the quinoa, black beans, sweet potato, 1⁄2 cup of the cheese, and the cumin, salt, and pepper. In a small bowl, mix together the eggs and the salsa. Pour the salsa mixture over the quinoa-bean mixture, then pour everything into the prepared casserole dish. 3. Sprinkle the remaining cheese over the top and bake, uncovered, for 30 minutes. Garnish with the cilantro. You mix in the quinoa. I'll amend those directions!